The García family of cigar craftsmen have become highly regarded as being among the world's best over the past two decades. Of course, the family's history in the cigar industry dates much further back, with legendary patriarch Don Pepín García being born into a large family of tobacco farmers/blenders in Báez, Cuba. Pepín García was somewhat of a wunderkind, quickly rising through the ranks and becoming among the most famed rollers and blenders in all of Cuba. Today, Pepín and his family own multiple tobacco farms and factories throughout Nicaragua and America, producing cigars for may of today's top-rated cigar brands (Tatuaje, Crowned Heads, L'Atelier Imports, La Aroma de Cuba, and more). 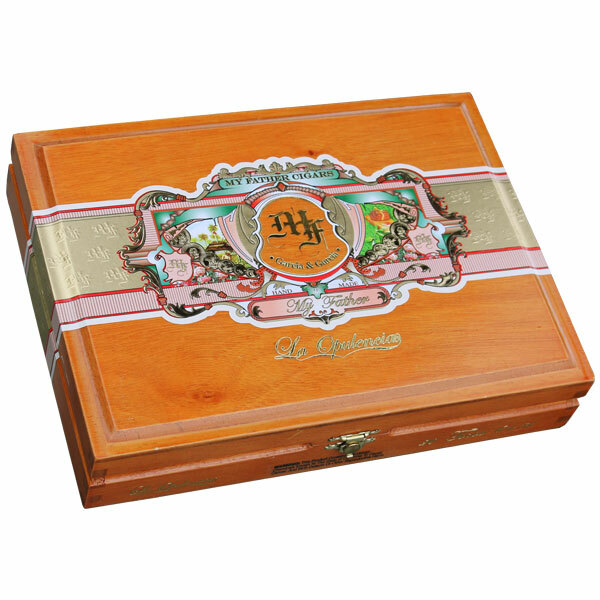 This includes the family's own My Father brand, an award-winning series that has become a favorite among connoisseurs for its classic and refined, yet full-flavored smoking experiences. New for 2017, the Garcías have expanded the My Father series with La Opulencia, a retired Cuban brand that translates to "The Opulent." My Father La Opulencia is the first blend in the series to utilize a Mexican wrapper, showcasing a very specific rosado oscuro-shade San Andrés leaf. The blend is rounded out by a double binder (Nicaraguan Criollo and Corojo) and Nicaraguan fillers grown on three of the Garcías' own farms. La Opulencia introduces a medium body and a rich flavors of earth, chocolate, black pepper, espresso, and aromatic, freshly cut wood.